The Thomond Park pitch has been left waterlogged by the adverse weather conditions. Ground staff are currently working to dry the surface. 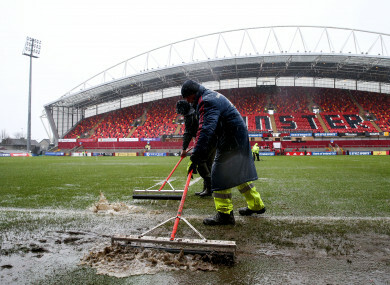 MUNSTER’S FINAL CHAMPIONS Cup pool game against Castres has been delayed until 4pm after the Thomond Park pitch was left waterlogged following heavy rainfall in Limerick. The concluding Pool 4 clash was due to kick-off at 1pm but referee Ben Whitehouse deemed the surface unplayable on health and safety grounds after a midday inspection. Large pools of surface water were visible particularly behind both try lines and despite the best efforts of the ground staff, the officials took the decision to delay the start time. The rain has eased considerably, but there are further showers forecast for 2pm. Munster have confirmed that supporters who wish to leave the stadium will obtain re-entry with their original match tickets. Johann van Graan’s side need to win their final pool game to book their place in the quarter-finals, while a bonus-point victory by more than five points would guarantee the province home advantage in the last eight. Providing it goes ahead, the game will still be shown in full on Sky Sports. The other game in Pool 4 — the meeting of Leicester Tigers and Racing 92 at Welford Road, which could have a significant bearing on the final standings — will go ahead at 1pm as planned, and no other kick-off times in today’s round six matches are affected. The adverse weather conditions which has hit most parts of the country has already wrought havoc with today’s sporting schedule, following the postponement of the AIB All-Ireland club semi-final ties and the O’Byrne Cup final. Email “Munster's Champions Cup clash with Castres delayed due to heavy rain in Limerick ”. Feedback on “Munster's Champions Cup clash with Castres delayed due to heavy rain in Limerick ”.